October has been such a wet month that when last Saturday's weather was dry and sunny, I decided to go to Fremont and sketch. 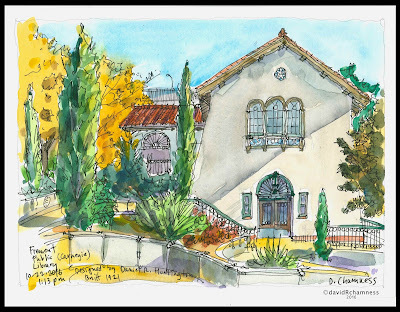 I have been by the old Carnegie Library a number of times, but always with others that precluded stopping and spending time needed to do the library justice. The fall colors were an added bonus and the small park on the west side allowed a clear view of the side of the reading room. 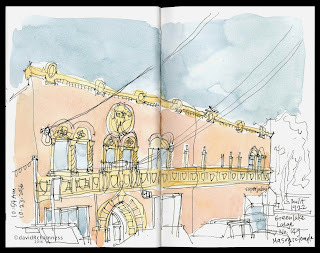 For a second sketch, I moved up to the front entrance on the north side. 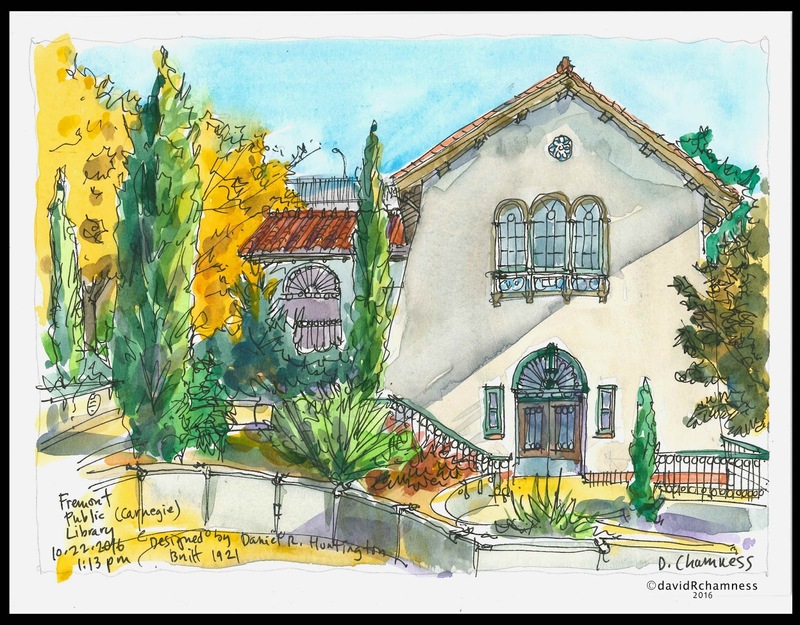 All the architectural details around the entrance and the rich colors of the roof and landscaping create an interesting composition. These two drawings will be donated to the Washington Trust for Historic Preservation's annual fundraising event in December. 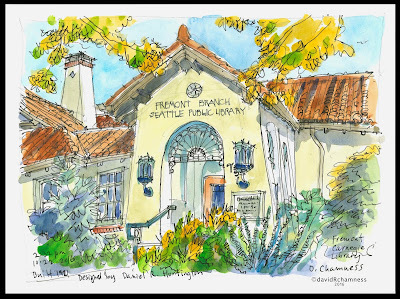 This non-profit is located in the Stimson Green Mansion on First Hill and they work diligently in the preservation of architectural gems for the public and future generations. The next day was our monthly sketch outing and so I headed to Greenlake Village to draw another couple of sketches over the weekend. I spent my time on two grand old buildings from earlier in the the 20th century. The 1921 Great Hall building and the 1922 Greenlake Lodge Masonic Temple. They sit a block from one another and have been active meeting spaces for almost 100 years. 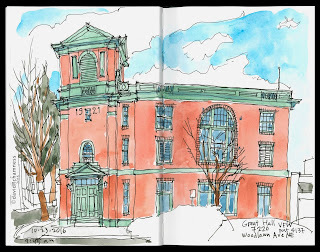 I love this part of urban sketching where you go to a neighborhood, where you have been before. 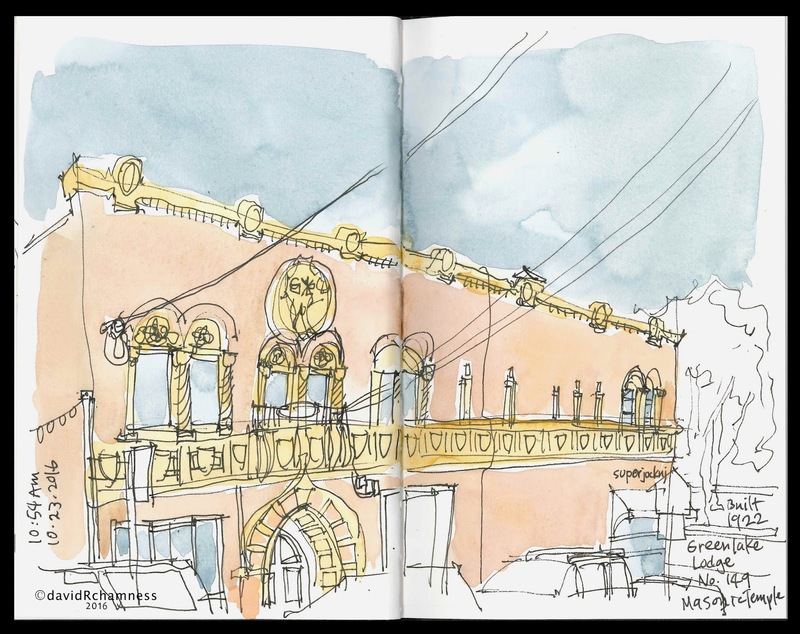 As you look around for something to sketch, you discover a gem or two. And sometimes you don't realize that fact until you really look at your subject for a while as you are trying to capture the image. I wasn't able to share with the rest of the group at the share time later (I had a Sounders soccer game to attend) so this is my time to share with others. They won too to get into the MLS play-offs! It was a great weekend doing the things I love. The drawings/paintings are beautiful and the editorials are wonderful! It encourages me to look at my surroundings with new eyes. Thanks David!